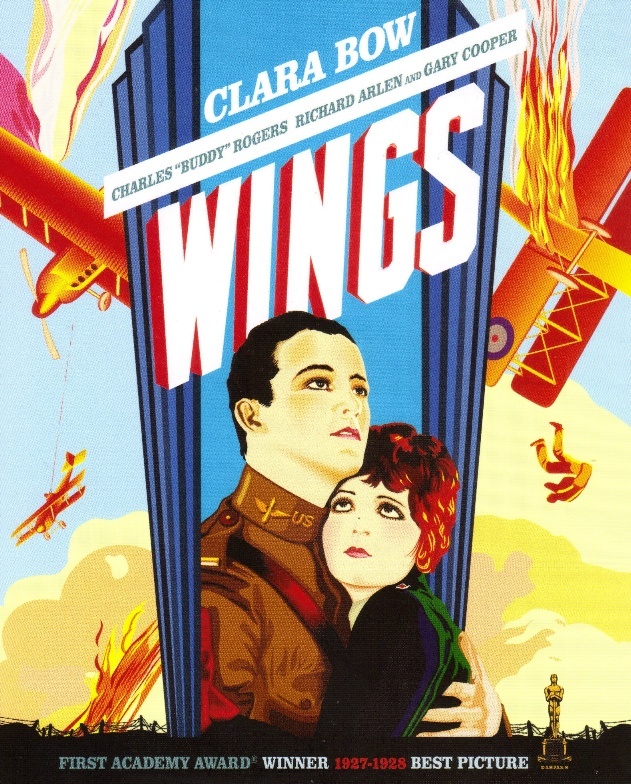 Wings (1927): Directed by William A. Wellman and Harry d’Abbadie d’Arrast. Written by: Hope Loring and Louis D. Lighton, from a story by John Monk Saunders. Titles by Julian Johnson. Original story ideas contributed by Byron Morgan. Starring: Clara Bow, Buddy Rogers, Richard Arlen, Jobyna Ralston, and El Brendel. Rated PG-13 for war violence. Running time: 144 minutes. The only silent film other than 2011’s The Artist to win Best Picture (or at the time, Best Production), Wings follows the friendship of two fighter pilots who enlist in the Air Corps and fight against the Germans in World War I. It’s perhaps best remembered for the dogfighting sequences, which are all the more impressive because most of them were actually filmed in the air. The aerial stunts and action aside, however, Wings settles for melodramatic hokum and a series of slapstick sequences that jar with the film’s “War is Hell” message. Once scene seems to have been lifted from an anti-booze PSA, in which one of the pilots hallucinates imaginary bubbles after more than a few glasses of champagne (who knows, Prohibition was still in effect at the time). Still, the film does come to a surprisingly tragic climax that helps redeem its forays into nonsense, and the flight sequences are exciting, if moderately repetitive. And though often silly, it does convey some of the horrors of war, and deserves some merit for not demonizing the German enemy.